The concept of ‘Pull to Push’ is tackled in the tech industry everywhere currently. It’s about making the services smarter, in order to offer new and relevant content to the user without any effort required by them. Since the beginning of 2017, we at ImmobilienScout24 started to make our services more pull to push likely. For the apps we were over months working on a greater vision. We evaluated user needs and the needs of the business. The good thing: Pull to push is — when tackled right — a good solution for both sides. What might come first in mind when thinking about push is notifications. So did we start evaluating our notifications. 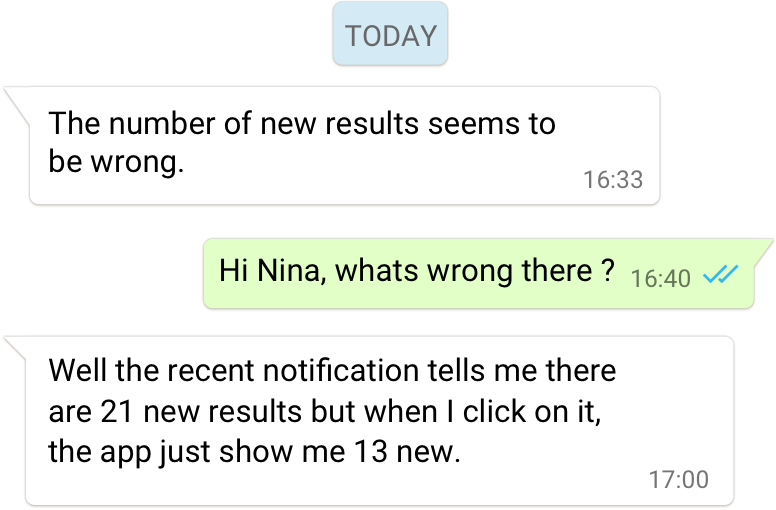 We knew our existing solutions of mobile notifications wasn’t great at that moment. As a result of other priorities, changing operation systems etc the notifications were more confusing as helpful – if we were honest. While iOS users just got notifications for their most recent executed search, Android users just got notifications for saved searches nor for the last search. We came up with a bunch of new kinds of content for the apps. 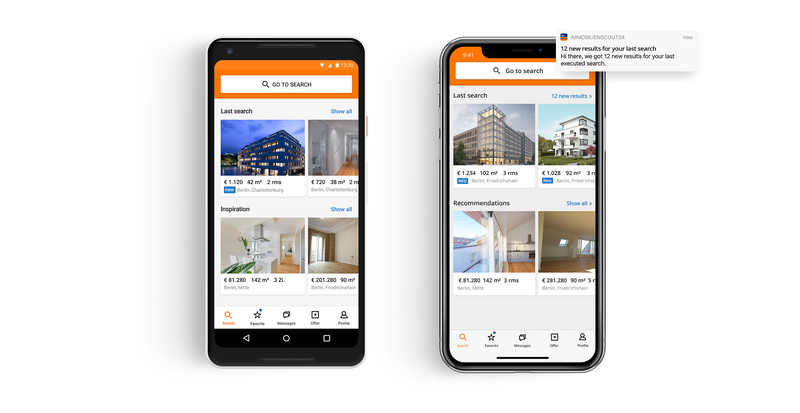 Simple things like an in-app notification for new messages by the realtor or a navigation bar bubble to indicate new results on the search tab. Most outstanding is the completely new home screen. With the home screen, we created a space where we can offer the user all new and relevant content in a decent way. It’s simply not a thing to shout out everything via notifications. So some kind of content has to have a space outside of the result list and the notifications. But the home screen shouldn’t be a vendor’s tray. So we put a lot of effort into the question: What is relevant to offer here – what’s not? It’s natural for a company and it’s departments, that they all want to have a piece of cake – they all want to promote they feature there. But it would become irrelevant and just feels like ads. So we decided to make the home screen fully personal. We started small and iterative. 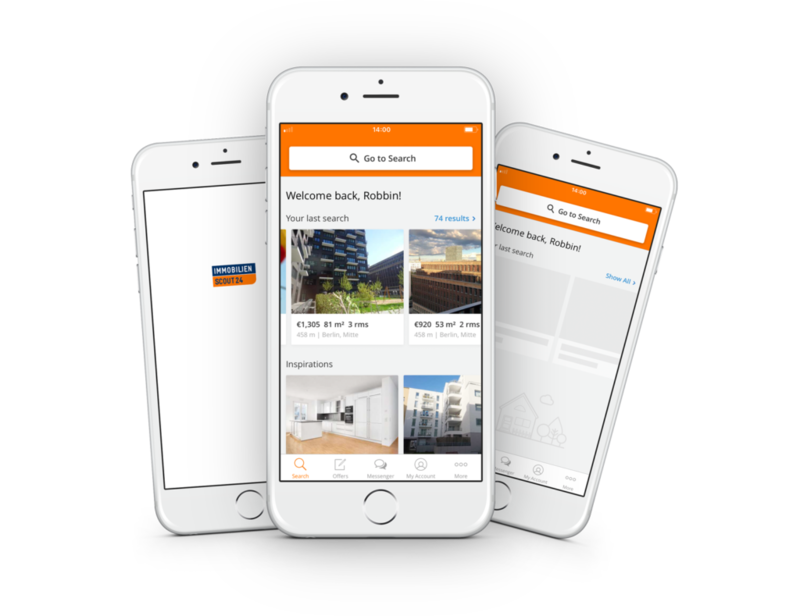 By the first release, we had a carousel of new properties regarding the users last search and a carousel of properties in surrounding areas of the search area. That is a pretty simple personalization, right? But relevant and so it’s a good start. By the time we introduced further elements, like recommended properties based on other users with similar searches. But more exciting as just carousels of properties: We promote monetization features when they might be relevant. For example: Is a user heavily looking for houses to buy, it might be relevant to bring them the topic of housebuilding closer. The tiles have a format that invites the user to interact with. The tiles are cutting the edge of the screen, so that the user knows – there’s more and he can swipe. Also since pictures of properties are mostly hard to view when small, we defined a good size to get enough out of the pictures but put enough tiles on the screen. Same goes for the meta information underneath. So we designed a new way to get to the filter but also we redesigned the existing one. We had A/B tests running on the new home screen and the new entry to the filter against the old version. It turned out, that the new way with the filter behind a button was actually used less. So might users not find the way to the filter? No, the carousel of last searches with its link to jump into the full list of results makes the execution via the filter simply irrelevant. So it was a success, both – filter entry and carousels. Here’s how we approached releasing all that great stuff. Our teams were working highly collaborative. The product management was constantly on the exchange with us designers. So kept constantly track of new features being released. We worked in 2 weeks release trains. By the end of any release train, the whole team evaluated what to do in the next 2 weeks. Product and design offered a direction but developers were always welcome to question that – and the other way around. Besides that, the team was holding a showcase to show what was archived to the whole team. Also within this meeting, the team got updated by the about following statistics: A/B Testing, User Testing, Conversion Rate, User Satisfaction rate, User Reviews, Sessions, Enquiry Reate, Downloadrate and more.